Take a flavorful tour of Spain through an assortment of quintessential Spanish cheeses. This grouping of four of Spain's finest and most flavorful cheeses arrives atop a black sampler board, making a beautiful hostess gift or a ready-to-serve party appetizer. Sip your favorite Spanish wine and indulge in a tasting flight that guides you through various regions of Spain. We hand-selected these four cheeses to offer a sampling of classic Spanish flavors, from buttery Mahón to smoky Idiazábal. 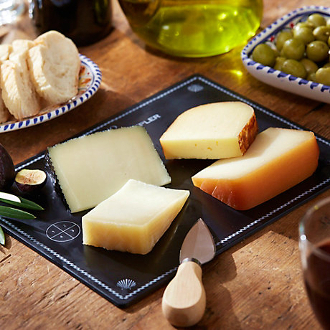 Each cheese is cut in Madrid and then vacuum-sealed onto an attractive black plastic slate that doubles as a serving piece. The cheese board contains in-depth descriptions of each cheese to guide your tasting. Our own Peregrino brand delivers high quality Spanish favorites that we personally discover and select during our excursions in Spain. Peregrino offerings guarantee our seal of approval as well as an affordable price for high quality Spanish delicacies. Mahón - A traditional aged cow’s milk cheese from the island of Menorca, this semi-hard cheese is slightly sharp with hints of butter and salt. It is versatile enough to serve as a tapa with olives; melted on toast; or on its own served with red wine or frosty beer. Slice and sprinkle with olive oil, black pepper and tarragon to experience it in its most traditional form. Manchego - Spain’s famous sheep’s milk cheese, with a complex nutty taste and pleasant sharpness. This creamy, full-flavored, firm cheese pairs well with cured Ibérico or Serrano ham. Serve slices at room temperature with a glass of wine to savor the complex flavor, or drizzle with honey and pair with fruit for an indulgent dessert. Ibérico - Similar to Manchego, but more mild and made of three milks, Ibérico cheese is beautifully balanced with a smoothness matching a pleasantly acidic finish. It is made using at least 50% cow's milk, lending a smoothness that adds nuance to the bright, tangy flavors of the other milks. Medium cured, with a firm bite, enjoy this favorite sliced in wedges and paired with fruit or a slice of membrillo quince preserve. Idiazábal - Crafted in the heart of the Basque Country, this aged sheep's milk cheese is hardwood smoked, providing a deep but subtle flavor. The smoke gently permeates its exterior and as the cheese ages, the flavor becomes sharper. Pair with fresh fruits, ham, salchichón and crusty bread and serve with a hearty red wine. We recommend serving cheese at room temperature to bring out its full flavor.